Wine is usually a fun topic, but in the Golden State, the fourth-largest wine-producing region in the world, it’s also big business: 85 percent of domestic wine comes from over 600,000 acres of grapes grown in California. Operating at this scale means the wine business must also consider land stewardship. 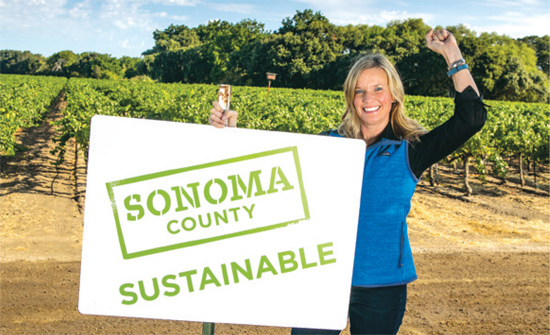 Two of the state’s biggest and best-known wine counties—the neighboring communities of Napa, which has more vintners, and Sonoma, which has more growers—are both working toward achieving goals of 100 percent sustainability within the next few years. Of Sonoma County’s million-plus acres, 6 percent of available land—58,000 acres—is planted with grapes. Between 1,400 and 1,500 growers farm that 6 percent of land; 85 percent of those growers are family-owned and operated, and 40 percent are operations of 20 acres or less. This means that if you grow grapes in Sonoma, you know your neighbors, you’ve probably been in the business for a few generations, and you pay dues to the SCW based on tons of grapes sold. Grape growers vote to assess their grape sales every five years, and the resulting money––currently about $1.1 million a year––goes to operating the commission. If you don’t sell grapes, or your winery uses its own grapes, you don’t pay. Karissa Kruse stands with a sign for certified sustainable vineyards. The reception was lukewarm at best. No farmer relished being told what to do. Eventually the board of directors approved it, and officially declared the goal at the January 2014 annual meeting, which typically sees around 500 growers in attendance. Despite the overarching decree, countywide sustainability is still a voluntary commitment. When growers perform their initial self-assessment, they must spend some serious time with a five-pound binder from CSWA. A farmer must score 2 or higher on the 4-point self-test before they can call in a third-party audit. 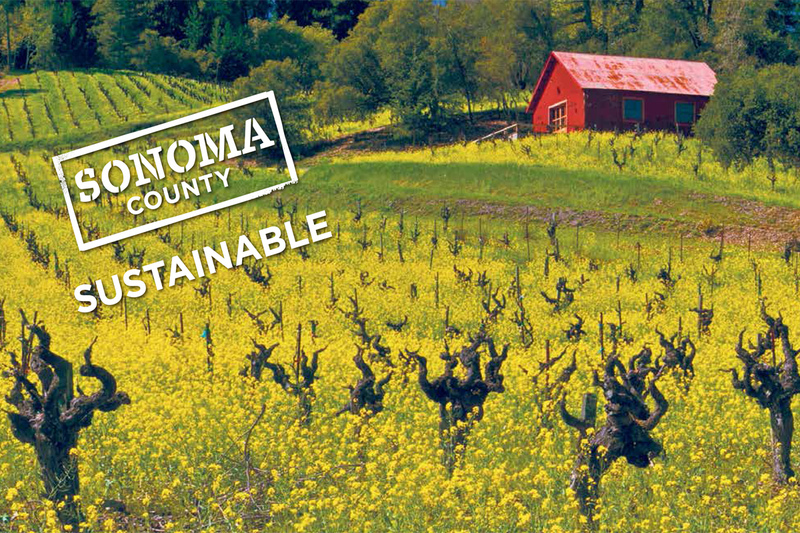 At that point, once the audit is passed (costs for the initial year run from $500-$5,000, depending on acreage and, while fees drop over subsequent years, every year has a fee attached), the farmer will receive a fancy sign they can hang along the road declaring they are “Sonoma County Sustainable.” In addition to signs, a new element in the county’s sustainability program includes the option to place a “Certified Sustainable” sticker on wine bottles, which Kruse thinks could arrive as soon as spring 2018. Despite the signs and the stickers, not everyone is embracing change. Until he saw that it was for the good of the land, Dane Petersen, father of Brad, resisted. “My father bought our property in 1945, so I thought we were already sustainable,” he said. “I was dragging my feet about getting involved.” It took him 18 months, but he finally dug in. “Once I went through it, I saw it was a good program. It opens your eyes to ‘no one’s perfect.’ It becomes an eternal program,” he said. Brad wasn’t surprised at his dad’s response. “The attitude isn’t resistance, it’s just a matter of, ‘I’ve been doing it this way for a long time. Why would I need to comply with someone else’s rules?’” said Petersen. When Tom Rochioli of Rochioli Vineyards finally took the test, he discovered he was almost 90 percent sustainable. His weak spot was purchasing, which also falls under the auspices of sustainability. A new tractor, for example, should run on biodiesel. Rochioli is a multi-generational farmer, winemaker, vineyard manager, and, with adult kids interested in taking over the business, a father thinking about the future. Rochioli understands that these best practices are good for his vineyard, but he doesn’t plan to take the steps to be certified. “I’m not against this stuff, I’m against being told what to do,” he said. ‘Sustainable’ Vineyards, Brought to You by Roundup? In addition to facing resistance from long-time farmers who are set in their ways, sustainability certification is also facing pushback from the organic side of the aisle. Two organic winemakers who would not go on the record with their concerns came out vociferously against the same pesky item: Roundup, which despite recent wins to label it as a carcinogen, is permitted both by the EPA and CSWA best practices, but not under USDA Organic standards. Sonoma is not alone in allowing pesticides like Roundup in its sustainability curriculum. In the 2014 book “Biodynamic, Organic, and Natural Winemaking,” authors Britt and Per Karlsson wrote, “There are many to whom organic growing is not a realistic option. This is why so-called sustainable growing has achieved such widespread impact all over the wine world. This approach is about conserving resources without jeopardizing profitability. It also means that synthetic chemical products are permitted.” In Europe and beyond, winegrowing practices span just as wide a spectrum: Unless noted as organic or biodynamic, one would have to read through a great slog of material to discover what rules were being followed. At Skipstone Wines, organic practices are critical and the vineyard team manages its 20 acres with an eye toward the rigorous standards of organic certification, right down to the hand soap it uses in the kitchen. “We don’t want anything going into our septic that isn’t organic,” said Emily Wines, Skipstone’s general manager at the time. Because commercial viability is so important in the sustainable model, most vineyard managers would have no qualms in turning to chemicals to treat a harvest that was in jeopardy. At Skipstone, it’s the exact opposite. “We recently had to pull out a vineyard, because we had a pest and we couldn’t deal with it, which isn’t very sustainable,” said Wines. Academics are also exploring just what makes a vineyard sustainable. Rhonda Smith, a viticulture farm advisor with the University of California Cooperative Extension, focuses on maintaining the longevity and sustainability of vineyards in Sonoma County, which means yield and vine growth. Smith’s opinions are research-based, and she believes that limited use of Roundup is fine. But, while “it’s regulated for use and it has a tolerance as a pesticide used in California,” she doesn’t consider the exclusive use of Roundup to be a sustainable practice. “A sustainable weed control program includes practices that manage resistance to herbicides. Glyphosate is only one tool and should be used with others,” said Smith. Others opposed to the marketing of SCW’s sustainability program are local neighborhood groups, which organize against sprawl, wildlife endangerment, and wetland pollution, to name a few key campaigns. Chris Stover, a retired tech analyst, is part of several community groups concerned about the use of pesticides and herbicides like Roundup. “You’re talking tons, probably hundreds of tons, of chemicals” that can leak into our area’s wetlands, which “capture carbon and are very good at helping climate change,” he said. According to a report from the California Department of Pesticide Regulation, 92,678 pounds—or just over 46 tons—of glyphosate were applied to Sonoma County vineyards in 2015. The chemical issue rings loud for many, but with the new government, changes to the EPA and more, it’s anyone’s guess where California agricultural will net out. For Stover, a sustainability problem is an education problem. “If a consumer knew that a winery used chemicals, depleted their groundwater aquifer, paved over wetlands for an event center and cut down all of their oak trees…they might not see it as sustainable anymore,” he said. While it seems implausible that every grower will become certified, and the controversy about just what makes a vineyard sustainable will continue, Sonoma’s goal may still be a victory overall, insofar as any steps toward better vineyard management is seen by most as progress. Ever the cheerleader for her campaign, Kruse feels the commission has helped spark both a local and global conversation. “Only good can come from this increased focus on the land, our employees, and long-term business viability,” she said. Yes: Water is an even bigger issue than the cancer-causing glyphosate. So if they are going to be "sustainable" I guess they will go back to dry farming. It covers Oregon and Washington, too, which have very different climates, therefore need different approaches. I hope it helps people be able to find sustainably grown and made wines in their area, and understand how complex this issue is. Thank you, Larissa, for this great work! Sustainability programs are good for conserving natural resources, overall - like water and energy - but lack any legal status, regulation or enforcement. The only standards that are truly green, in my opinion, are those that include organic or Biodynamic standards. These both have legal status, regulation and enforcement. Sustainability programs are created by the wine industry for the purpose of both self improvement AND green marketing. In addition, the sustainability programs in wine have done market research and have found that 43% of consumers think sustainable means organic. This kind of deception should not be allowed to continue...so support organically or Biodynamically grown wines...there are lots of great producers out there! There is local movement to get glyphosate out of parks and schools. I am working to help with that. Using glyphosate/ roundup and saying you are a sustainable winery makes no sense since the word sustainable implies we are sustaining the health of our environment for our grandchildren.